New Lanark is an 18th-century planned industrial village located on the floor of the deep gorge of the River Clyde by Falls of Clyde. The site features restored millworker houses, a village store and working textile machinery, with walks through a nature reserve along the river. 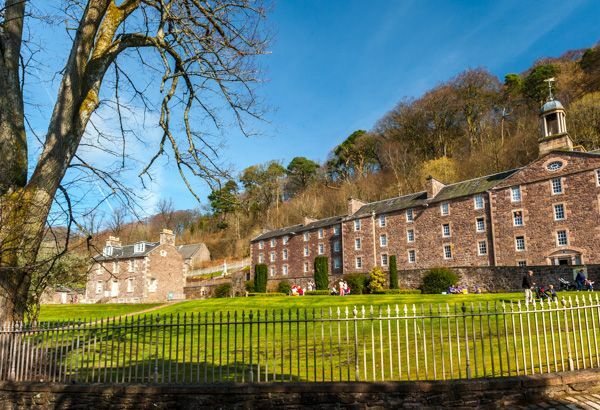 New Lanark is officially recognised as a World Heritage Site. 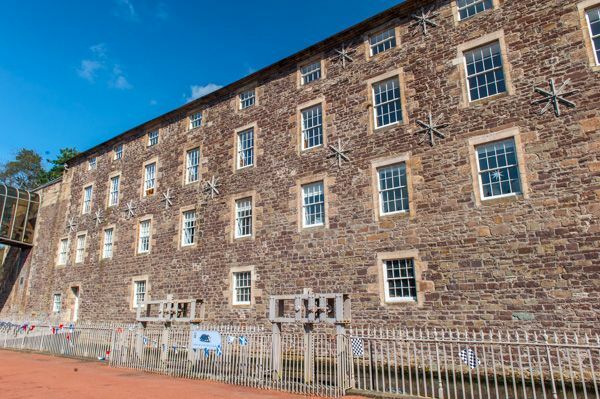 The roots of the New Lanark industrial site go back to 1784 when a Glasgow businessman named David Dale came to the area with Richard Arkwright, inventor of a water-driven spinning frame. Dale and Arkwright were looking for a site with a good water supply, to establish cotton-spinning mills. The new village opened in 1785 and was called New Lanark, to distinguish it from the old royal burgh of Lanark on the hilltop above. Unfortunately, Dale and Arkwright did not get along, and in 1786 they dissolved their partnership, leaving Dale as the sole proprietor. The first mill opened in 1785, with 3 waterwheels driving 4500 spindles. A second, larger mill, opened in 1788. The first row of tenements for workers opened in 1790, the same year as a house for David Dale and another for his site manager, William Kelly. More tenement rows of cottages for workers were built in the last years of the 18th century. In 1798 a young mill manager from Manchester named Robert Owen visited New Lanark for the first time. The following year Owen married Dale's daughter Caroline and convinced John Barton of Manchester and John Atkinson of London to partner with him in purchasing the New Lanark site from his father-in-law for 60,000 pounds. 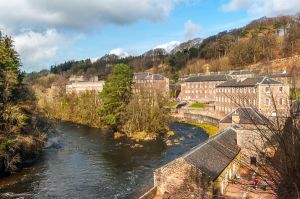 Owen took control of New Lanark on 1 January 1800, and immediately began his 'Great Experiment' of social reform. Over the next 2 decades, Owen built apartment houses, a machine and dye works, Counting House, and a village store. The concept of a store run by the company was now a new one, but Owen broke the mould by selling quality goods at fair prices. Workers were given the option of being paid in tokens or tickets which could be exchanged for goods at the store. 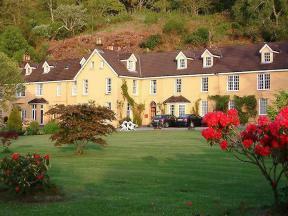 In 1816 Owen built The Institute for the Formation of Character, a social and educational centre for workers, offering adult education classes as well as social activities. In the following year, he opened a companion building, The School for Children. Despite the controversial social changes created by Owen, he was dissatisfied with the pace of change in Britain, and in 1824 he left for New Harmony, Indiana, in the US, where he thought he would be more successful promoting his ideas. Owen sold New Lanark to the walker family, Quakers from London. The walkers kept some of Owen's ideas, including the Institute. The mill continued operating in one form or another until 1968. 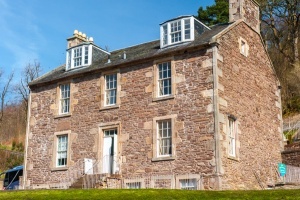 In 1973 all the buildings on the site were given A-listing status by Historic Scotland, and a charitable trust was set up to restore and preserve the site. The result is the remarkable site we can visit today, a mix of industrial heritage museum and working village. 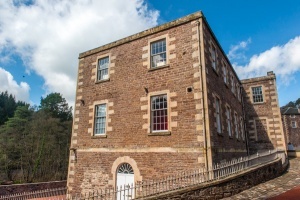 This is the only house in New Lanark with more rooms than people! It is by no means an elegant dwelling, but the comparison with the nearby millworker's tenements is striking. 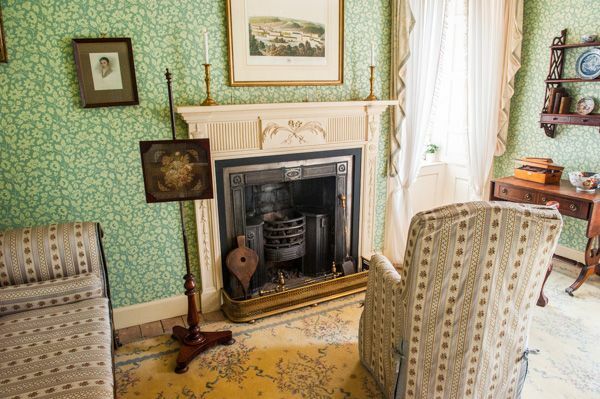 You can see Robert Owen's desk, original furniture in the sitting room, and descend to the cellar kitchen. 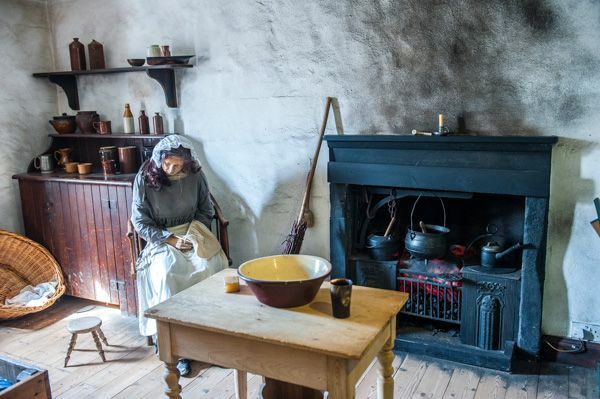 One of the 1820s Millworkers' houses has been restored, recreating the life of a worker from the dawn of the Victorian age. As many as 10 people lived in each room of these simple cottages, with hidden beds that were pulled out from under other beds. A second cottage has been restored to the way it looked in the 1930s. The store was opened by Owen in 1813, offering good quality merchandise at a fair price. 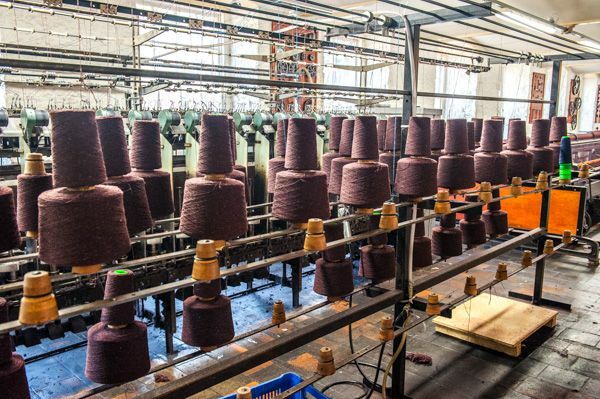 Trace the connection of Owen's ideas to the modern co-operative movement and the ideals of Fair Trade. The shelves have been stocked with early 19th century goods - as well as modern sweets. This huge building now houses the main visitor centre and exhibits on the history of the site. 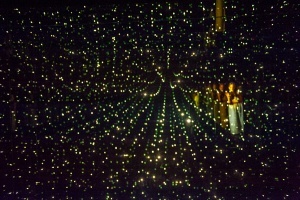 The star attraction is a 'dark ride' which introduces visitors to Annie McLeod, a real-life child worker at New Lanark. Through Annie's real-life story we learn what life was like for children, and adults, working under Robert Owen. One of the highlights at New Lanark. Robert Owen was convinced that good education was the cornerstone of social reform. Here at New Lanark he created the first Infant school in the world and established a comprehensive education system. 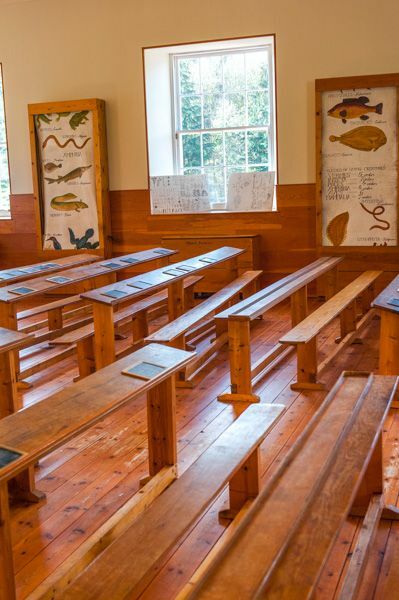 The schoolroom has been restored to the way it looked shortly after it was established, complete with a huge globe showing the world as it was understood in the 1820s. Children can dress up in school uniforms and try their hand at using a slate and chalk. Trails lead from the main visitor attractions, following the River Clyde though a woodland nature reserve to a series of waterfalls. Special brochures are available which explain the natural history of the area and what animals and plants you can encounter. Was New Lanark a successful social experiment? Robert Owen was certainly not satisfied with what he had accomplished here. And no, the revolutionary ideas that Owen established at New Lanark did not create a new wave of socially responsible industrialism. And yet, the ideas that Owen implemented at New Lanark, and in his subsequent social experiments in America, helped change the world forever and heavily influence so many of our modern ideas about work and life. 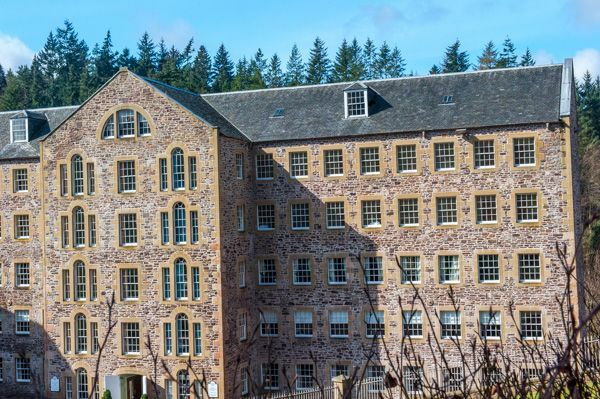 It is impossible to overestimate the profound effect that Owen's ground-breaking utopian vision of New Lanark has had, and continues to have, on our world. It is appropriate to point out that New Lanark is a village, not a museum. People still live and work here, and only some of the buildings are open to the public. Many of the original dwellings have been completely refurbished and are occupied - and apparently, there is a long waiting list for renting a cottage. Other industrial buildings are now used as a popular hotel, a youth hostel, shops, and restaurants. Be aware that the car park is at the top of a fairly steep hill, and it will take some energy to climb down to the site, and back up again! I was incredibly impressed with New Lanark. Though visiting Industrial Heritage sites is not usually my favourite occupation, I loved New Lanark. After spending an afternoon exploring the site it was impossible to come away without being impressed by what Robert Owen created here. What is truly remarkable is just how little of the site has changed since the early 19th century. You can really get a clear idea of how the mill workers lived and worked, and what a difficult existence it must have been. There is a very good mix of things for children and adults to see, and the location is superb. a must-see. Nearby accommodation is calculated 'as the crow flies' from New Lanark World Heritage Site. 'Nearest' may involve a long drive up and down glens or, if you are near the coast, may include a ferry ride! Please check the property map to make sure the location is right for you.